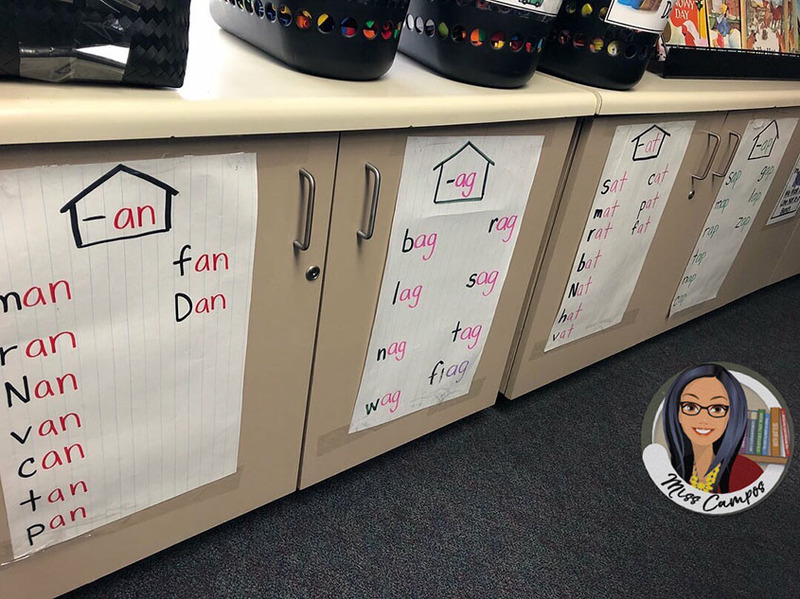 When I was a student teacher, I taught in Spanish to earn my bilingual teaching credential (BCLAD) and we led all of our reading programs by teaching open syllables in a consonant-vowel pattern. This was the key to successfully teaching kids to read for Spanish. When I switched to teaching in English, I struggled to find what the equivalent important spelling-pattern would be for English. Syllables just don’t work well for English the way they do for Spanish. However, words that follow a consonant-vowel-consonant pattern, known as CVC words, definitely fit the bill. 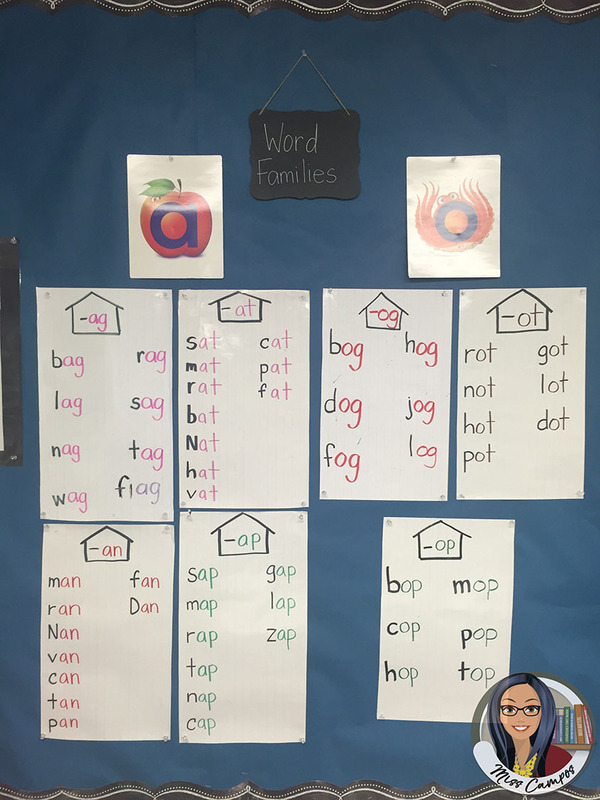 CVC words should be an essential part of every Kindergarten class. 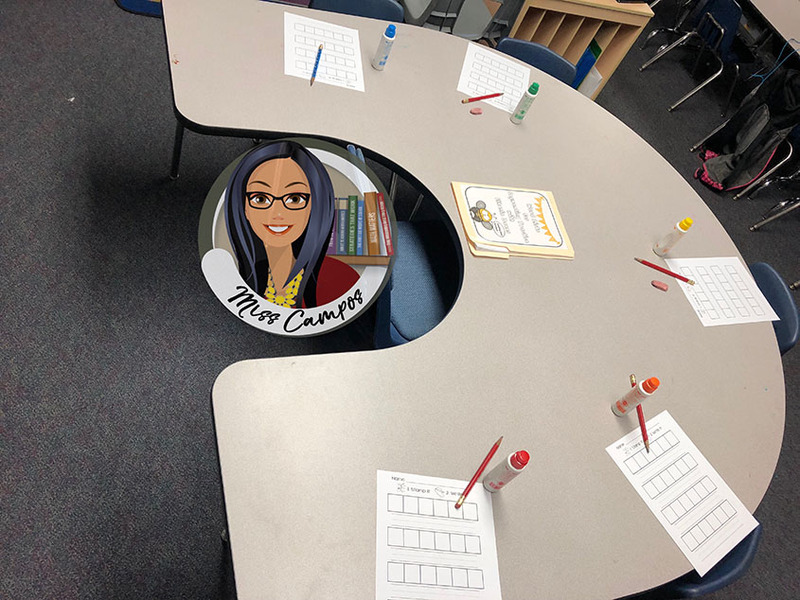 Starting with the third week of Kindergarten, I begin my guided reading lessons with a game I call, “Stamp it, Write it.” It is a phonemic awareness game that focuses on segmenting CVC words. I set up my table like the picture above. Then we rub our hands together and I tell them, “Sharpen your word cutters!” Once they’re sharp, we keep one arm straight over the table and one with an open-palm mimicking a karate chop. We chop our shoulder and echo-repeat the first sound in the word. Then we chop our elbow and say the second sound. After that, we chop our wrist and say the third sound. Last, we pick up the dauber and daub a dot in each box and echo-repeat the three sounds with each dot. Finally, we pick up our pencil and write the three sounds underneath their respective dot. This process starts off quite clumsy but it all becomes very automatic after a few practice sessions. 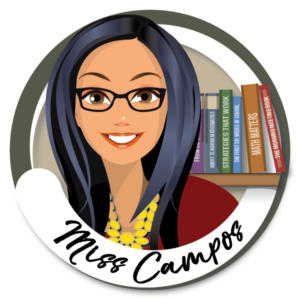 In order to always have a fresh list of words handy, I created a master list of compound words, CVC words, CCVC words, CVCC words, CCVCC words and Magic E words that I reference all year long for this segmenting warm up. The master list comes with a sheet for Elkonin boxes and a strip of dotted lines for writing as well. 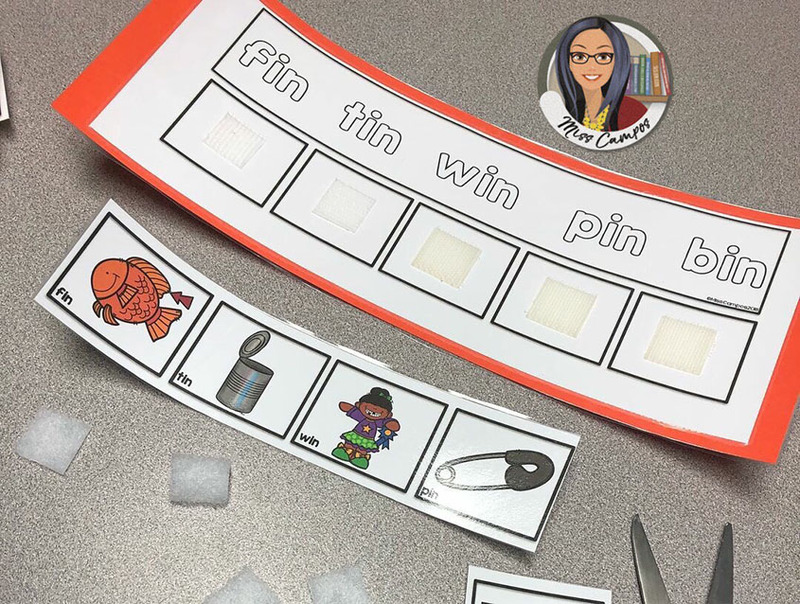 If you would like to own this master list, I sell it in my TPT store under the title: Phonemic Awareness: Leveled Word Lists for Segmenting Practice. Click the title to be taken to that product. However, if you’d like a free one-page list of CVC words only, click on this link instead: One Page CVC Word List. 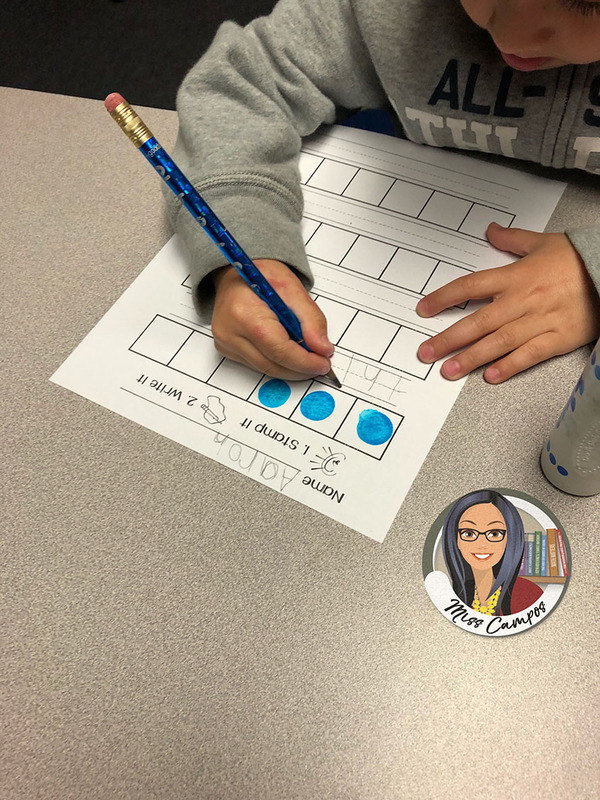 I keep a collection of daubers in multiple colors in a drawer near my guided reading table at all times. I purchased these two sets of daubers at a store called Lakeshore Learning. But one year, I used nothing but daubers from my local casino’s Bingo room. I just put a big Avery label over the casino logo so kids or visiting parents wouldn’t notice. I also run off a very large stack of Elkonin box pages and use them throughout the school year. Frequently, I store the master list and a stack of Elkonin box pages inside the dauber drawer too. 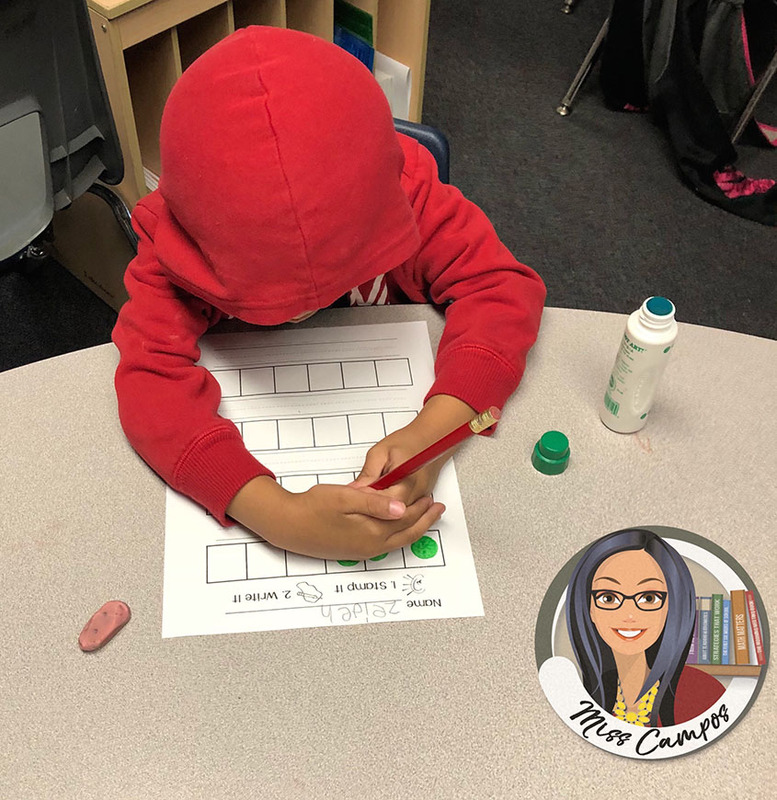 This little guy pictured above is in the middle of concentrating on writing the letter that corresponds to the sound he stamped. Meanwhile, this little guy pictured below sure doesn’t want anybody copying him so he puts a hand up as a barrier so nobody can see his writing. Eventually, I encourage everyone to do it this way because kids will definitely copy when they see others recalling letters faster than they can. When I see this happening, I bring out a poster of the alphabet and have the struggling kids reference the chart to find the letter of the sound their struggling to write. While at the Target dollar spot one day, I picked up these chalkboard cube sets. 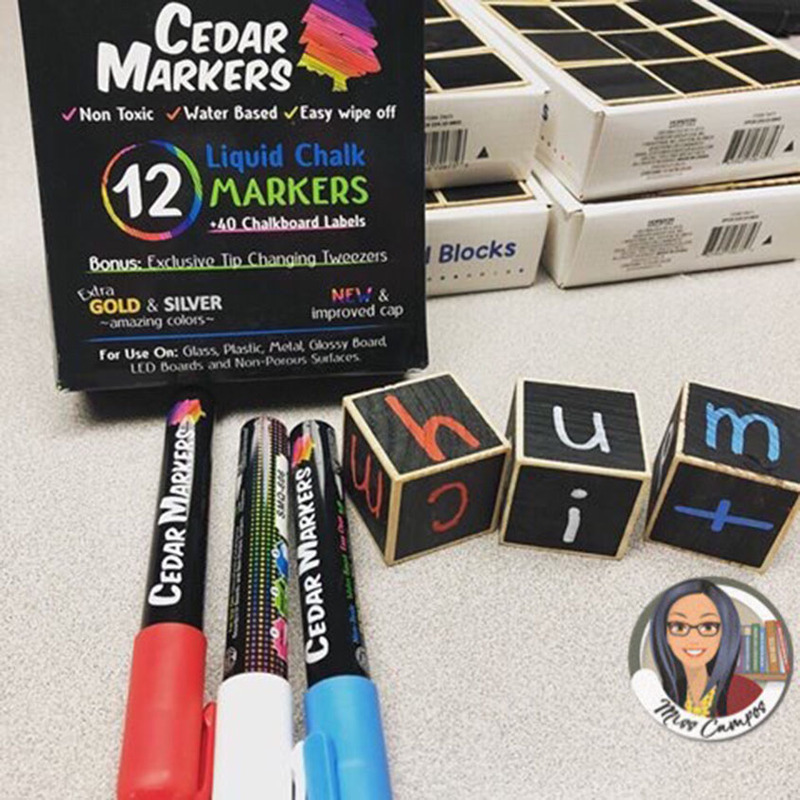 I went on Amazon and ordered these chalkboard markers later as well. 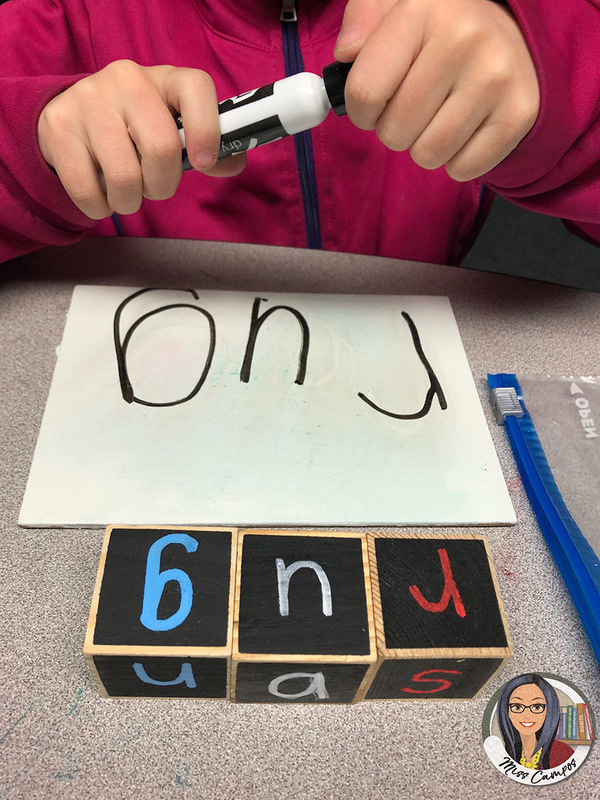 My original intention was to build my own alphabet blocks and have kids order them as a literacy center. However, I’ve been using them for CVC words and I love it. As you can see, I purposefully chose only three colors: red, white and blue. Yes, I am patriotic but that’s not why I chose those colors. I chose them because I wanted kids to always order their blocks from left to right each time they built a word for me. I thought those three colors would help them remember the placement. Referencing my master list of words from the dauber drawer, I chose the most common onsets for the red cubes. The vowels are in white and the most common word final sounds for CVC words are in blue. We usually flip one cube at a time starting with the red cube. We can build words like: cat, rat, mat, sat, etc., because only the onset changes. Then we leave the red cube on a common sound like c or m and start flipping the white cube. We build words like: cap, cup, and cop this way. Last, we flip the blue cube to build words like: hit, hip, him, and his. No matter which cube we are flipping we always write down the word on a mini whiteboard. This way, we can take turns spelling the word aloud as we erase one letter at a time. 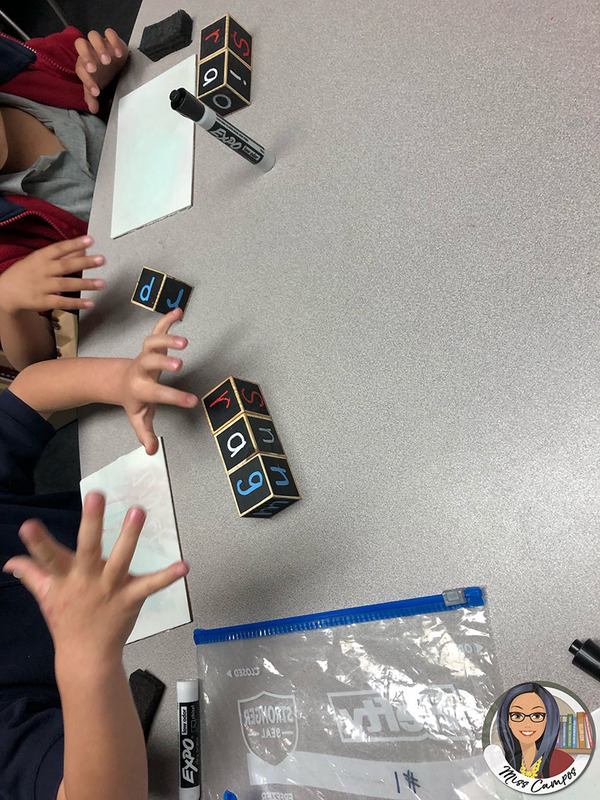 When we flip all three cubes at once, nonsense words are frequently created. For this, I use the following sheet: Nonsense Word Sort to write the words down on. Then, they can take that sheet home once we fill it up from top to bottom. 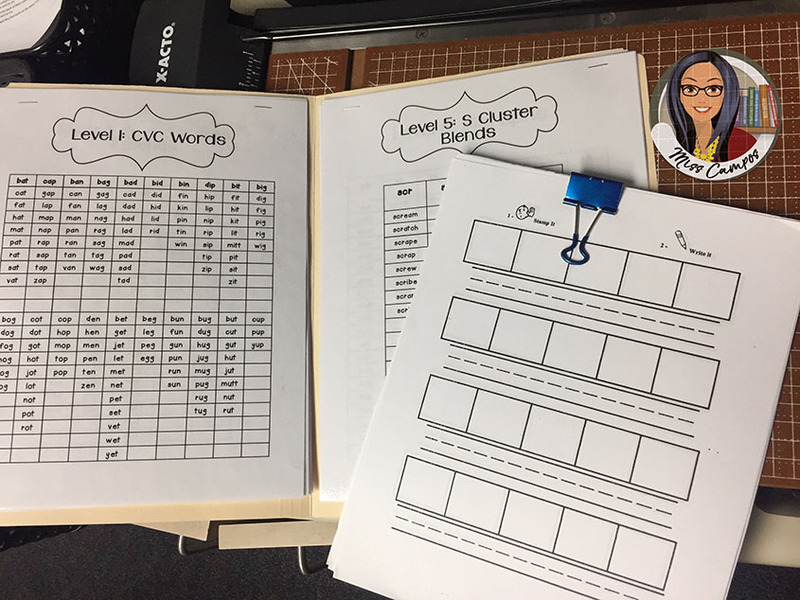 When we come back from Winter break, I shift my focus from the oral blending and segmenting of CVC words to reading and writing CVC words as well. 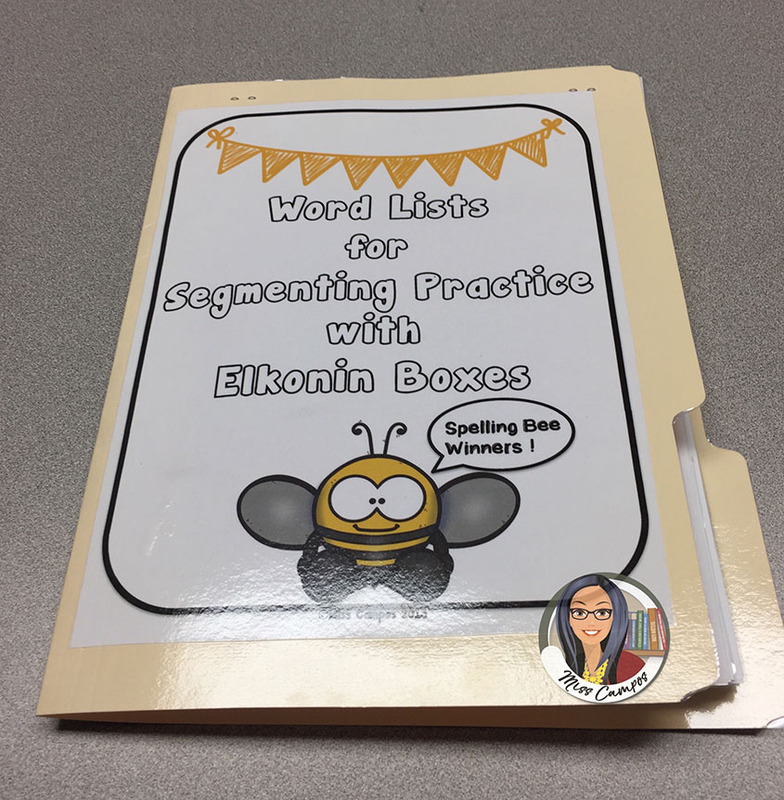 Typically, I start the year off teaching one letter-per-week as a theme and as a phonological awareness focus. However, as I tell parents during Back to School Night, by Winter break, I expect the class to know at least 20 sounds of the alphabet fluently including the five short vowels. (I’ll post about how I support them through this ambitious goal on a separate blog post.) 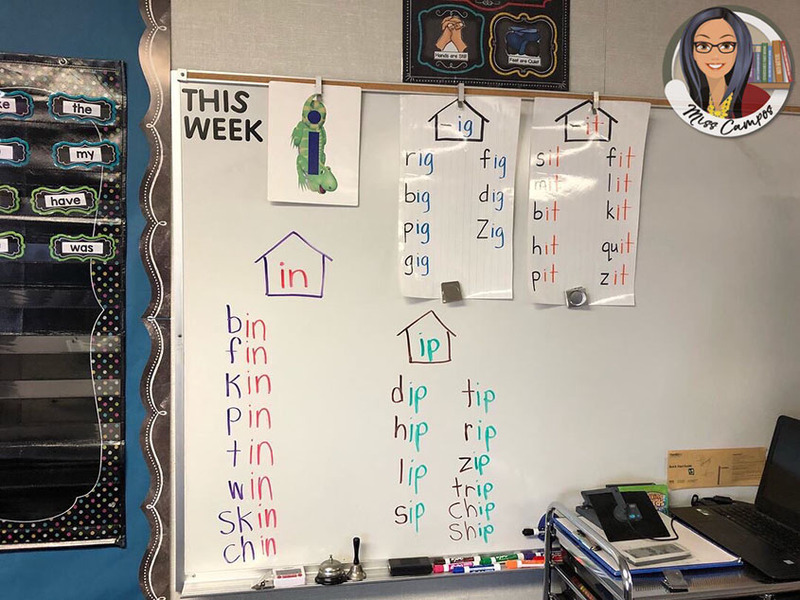 To further emphasize this shift in our reading focus, I drop focusing on one letter-per-week and begin one short vowel CVC group per week for a total of five weeks. Our class focus wall gets filled with CVC word posters color-coded by onset and rime. The ones we have passed are used as decoration around the room. During writing time, I have the kids reference them as part of their writing centers. They can write them, read them, and stamp them with alphabet stamps and much more. I also share pictures of these posters to my students’ parents on Class Dojo so they can recreate them with markers and poster paper at home too. I send them a matching game called CVC Word Match too. You can download it by clicking on the title. I liked the large, simple posters so much that I decided to make mini versions of them. One day, I typed up little flashcards that match the format of the large posters where the onset and rime are different colors. 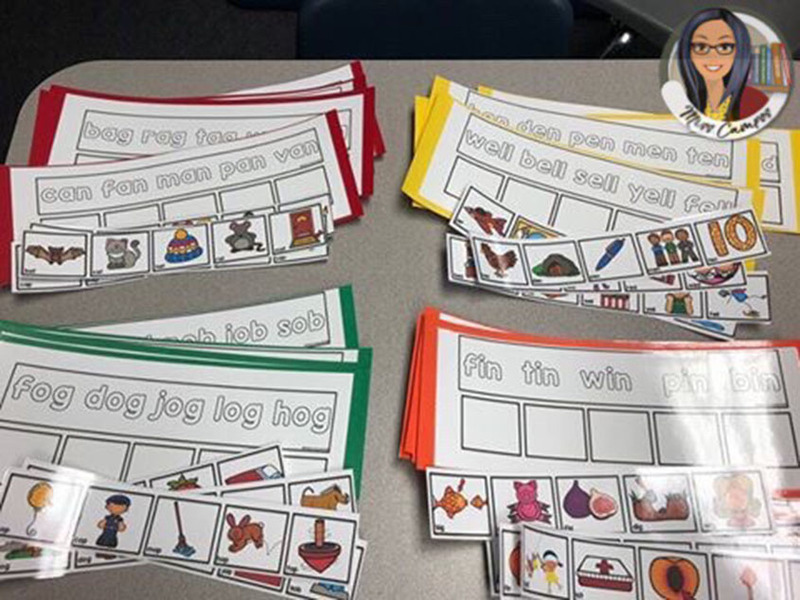 I took some yellow paper, a black marker and a laminating machine and it’s been one of the best literacy centers I’ve had in my class for the past 5 or more years. I keep waiting for them to break down to replace the tacky marker writing but they keep holding up so I haven’t replaced them. If you would like to build your own nice version, I have made a much lovelier master for you to download. Click here for the download CVC Sorting Cards and Mats. 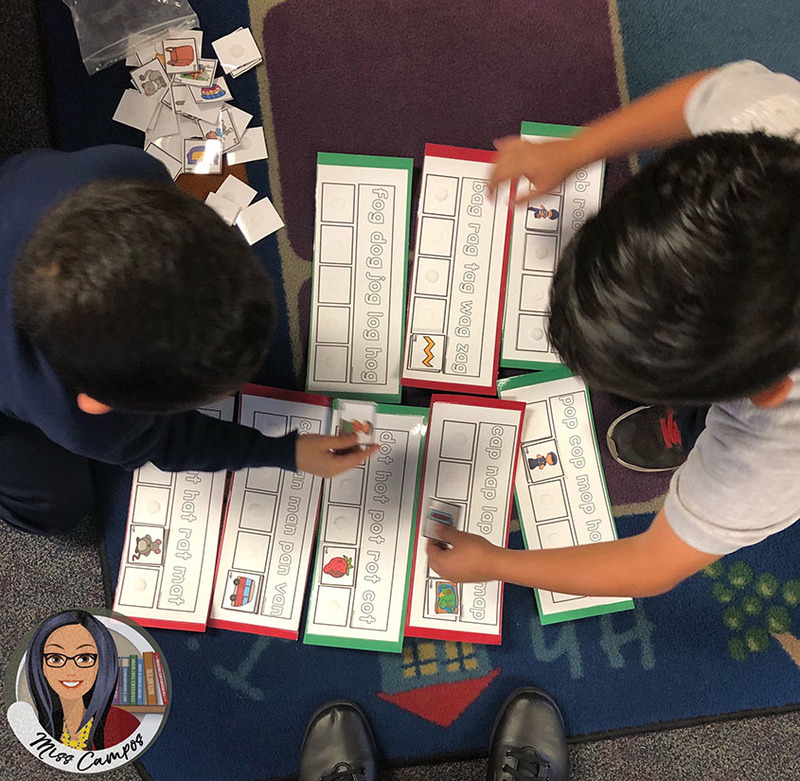 The kids really enjoy using pointers to read each card when they are done sorting the words. This is a fun time of year! Kids really blossom during these five weeks of emphasizing CVC words. I have over 15 products in my TPT store that feature CVC words. When you visit my store make sure to check on the category list on the left side and click the green link that says CVC Words. 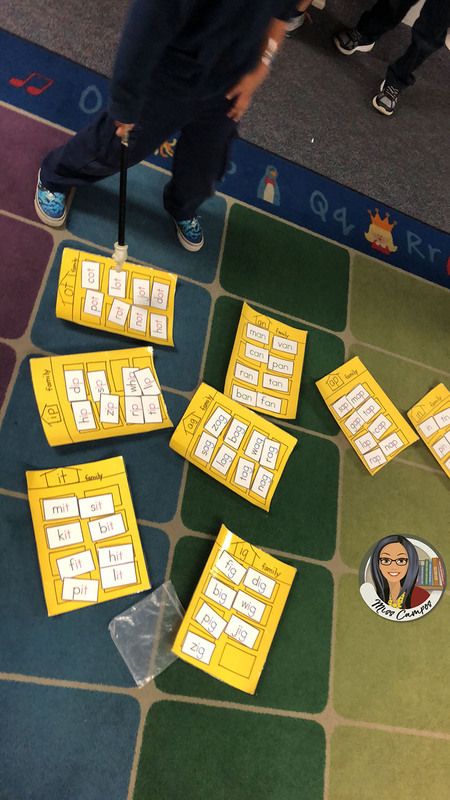 One of my favorite activities features these picture-sorting mats. They are easy to print and prep. I have used them with and without Velcro circles and they work well each way. The best part of this product is that it is differentiated on three levels. Photographed is the medium version that has the CVC word typed in black font on each picture. So kids just need to match the black words to the white words. The difficult version has no words on the pictures. The easy version features no words either but the mats have gray scale pictures underneath each white word so kids just match the colorful pictures to the mat. My students head into Spring break full of confidence in their abilities to decode CVC words with short vowels. 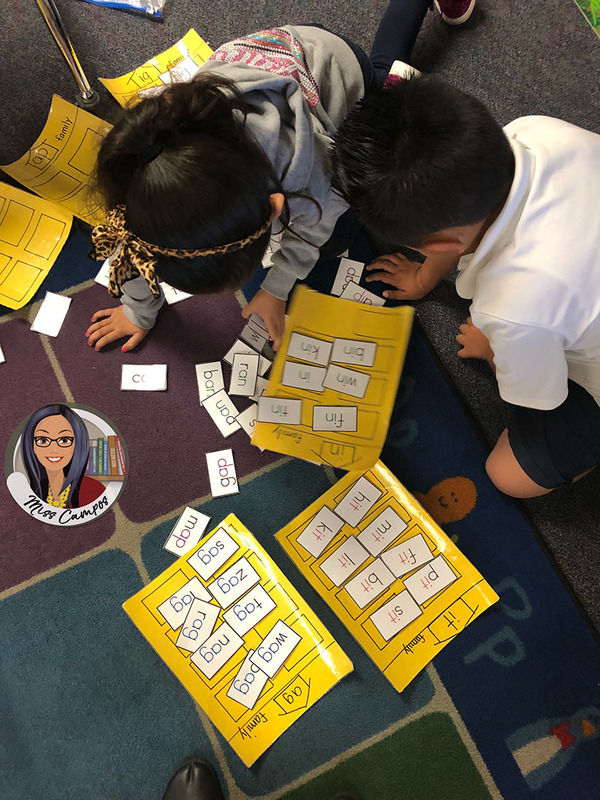 Their journey starts with phonemic awareness (oral blending and segmenting) includes fluency with phonics (especially vowels), structured phonological awareness in leveled reading groups and ends with multiple opportunities to read and write CVC words. Keep the faith during your class’ journey and your students will get there too.